This is a very nice GREMLINS 2: The New Batch original movie prop. 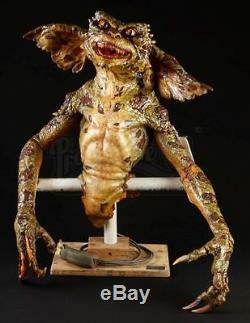 This is a Gremlin and comes from the personal collection of Rick Baker! The COA comes signed by Mr Baker too. A Green Gremlin Puppet from Joe Dantes horror comedy Gremlins 2: The New Batch. This Gremlin was made for shots of upper body motion. This foam latex Gremlin is painted with a green and brown pattern to match the other Gremlins in the film. The puppet features detailed cable controlled yellow acrylic eyes, sharp resin teeth, and a cable controlled arm. The Gremlin is presented on a PVC pipe rig that is mounted to a wooden base. This piece has undergone sympathetic conservation and stabilization. Overall this puppet remains in fair condition. This at buyers expense how ever thay like me to the eyes move back and forth also blinks Using the controll its a real amazing prop vary cool! The item "GREMLINS 2 Original Movie Prop/Puppeteer RICK BAKER COLLECTION Signed COA" is in sale since Sunday, July 16, 2017. This item is in the category "Entertainment Memorabilia\Movie Memorabilia\Props\Originals". The seller is "ruthsmustep" and is located in Grayslake, Illinois.